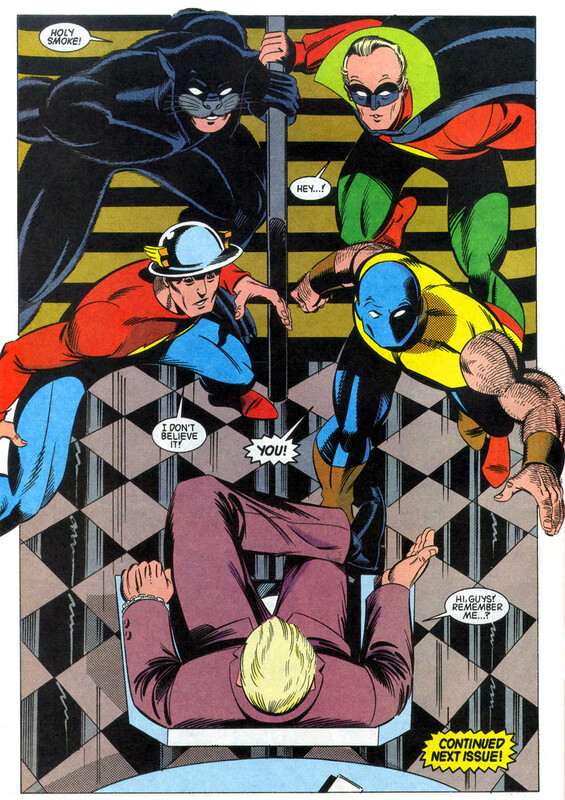 Summary: While on their way to a JSA meeting, Atom and Wildcat stop two thugs from beating up an Ultragen protestor. After joining Green Lantern and the Flash for the meeting, a videoscreen conversation with Hawkman and Hawkgirl convinces the Atom that the JSA still has a role in today’s society. 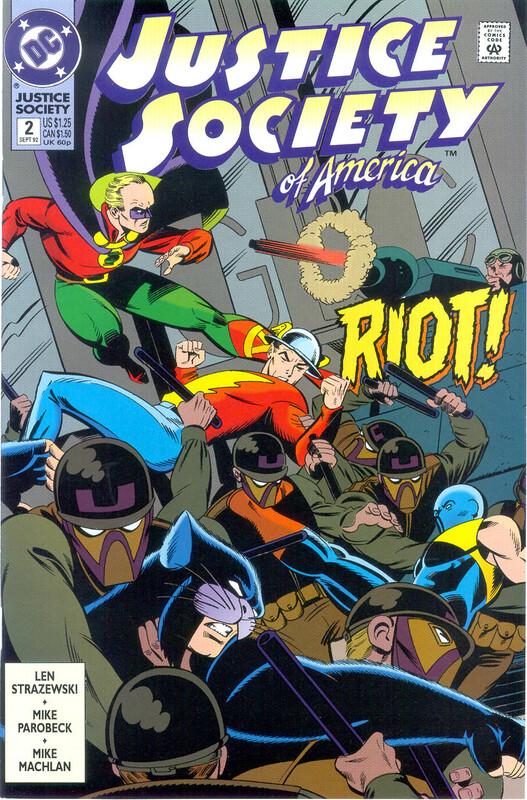 Green Lantern receives word that a riot has broken out across the street, leading the JSA to protect more protestors from Ultragen’s aggressive guards (who have been heavily armed by a mysterious source). 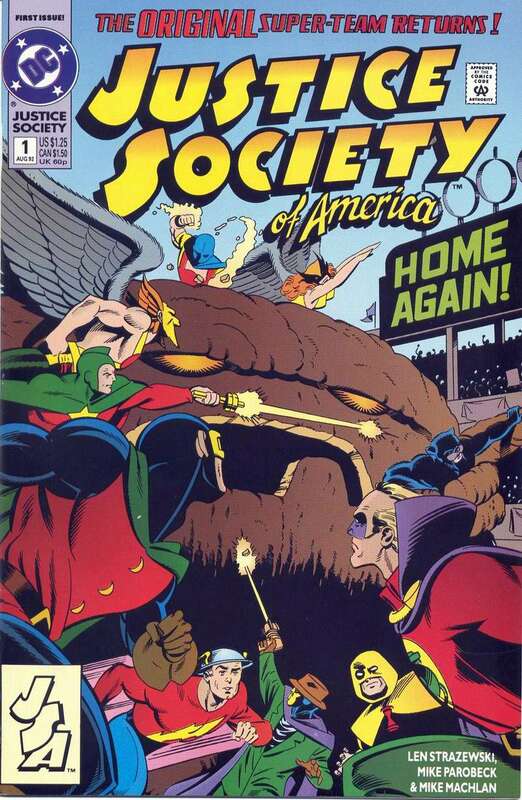 Later, the JSA returns home to discover a shadowy figure in their headquarters. Irrelevant Continuity: The JSA are given more of a specific age, with Wildcat claiming that they’ve “plateaued at sixty or so.” Plus, Hawkman and Hawkgirl have a son who died in the early issues of Sandman. Total N00B: Apparently, Wildcat was recently in a wheelchair. Precisely how he recovered isn’t addressed. I also don’t know how the Atom has the ability to use his fist like Iron Fist’s, since I was under the impression that he was simply an unusually short man who challenged himself to reach his physical peak. Review: Strazewski is still slowly rebuilding the team, as two more members rejoin while we receive a few excuses for why the others can’t make it to the meeting (Sandman has the best one -- stroke). I’m sure if he knew the series was doomed to a ten-issue run, Strazewski wouldn’t have opened with such a slow burn. By the time the team is fully assembled and ready to begin whatever mission they decide to embark on (they’re currently debating if they’re too old to be active superheroes), I have a feeling we’ll be on issue #10, or close to it. Even if the plot is a little slow, Strazewski is able to write the cast as a likable group of old friends, and his characterization of Atom as an insecure elderly man who’s awkwardly easing back into superheroics uses the book’s premise well. I think using two mystery men in separate plots is overkill, though, even if the identity of the intruder is sure to be revealed next issue. There’s also the massive coincidence that has the mystery foe from the last issue arming the security guards of a no-doubt evil corporation in this issue…a corporation that just so happens to be located across the street from the JSA’s secret headquarters. Perhaps this is a tongue-in-cheek nod to some of the convenient plotting that often showed up in Golden Age superhero stories, but it’s the kind of idea that really doesn’t work in a modern context. 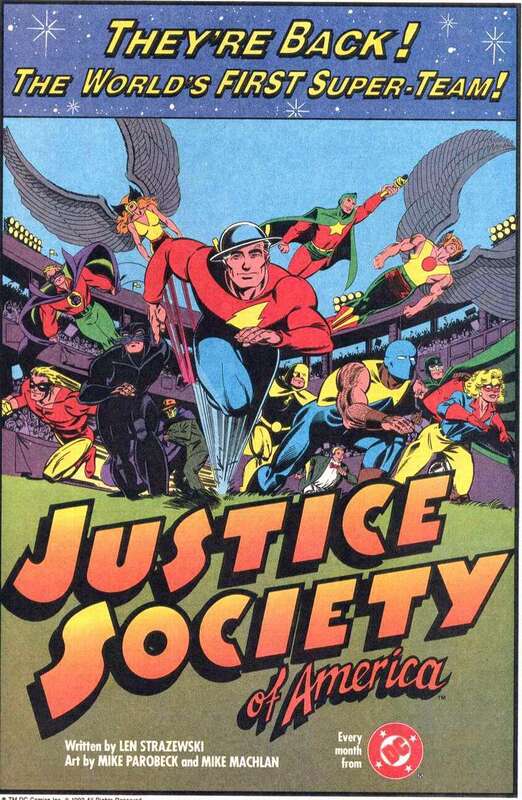 Summary: A mystery man sends a colossal monster to attack the Justice Society at their public retirement party. The monster is stopped by Superman, much to the JSA’s disappointment. Following the battle, Sandman suffers a stroke. Several months later, Flash and Green Lantern respond to news reports of the New Order’s assault on a nuclear plant. They easily defeat the modern foes and are inspired to come out of retirement. Total N00B: I’ve been reading comics for around twenty-five years now, and this is my first encounter with Johnny Thunder, who only appears in the background of this issue as a normal looking schmoe in a Jimmy Olsen suit. A helpful text piece by Mark Waid in the back describes him as “not the brightest man who ever lived…Johnny could nonetheless hold his own…by calling out the magic command ‘Cei-U’…and summoning to his side the mighty genie known as Thunderbolt.” So…he’s a dummy with genie powers? 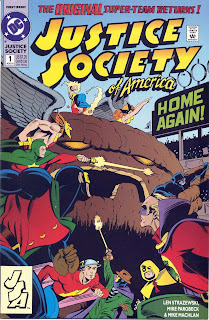 Was he the JSA’s wacky sidekick back in the day? Review: So, DC’s Justice Society of America #1, released the same month as the debut issues of Image titles like Shadowhawk. There’s no spine-shattering here, but one old guy has a stroke while his friends are bummed that some young hipster, Superman, is upstaging them. There’s definitely a culture clash going on here, but the creative team is trying to face the issue head-on. Instead of just tossing in a few cutsey references to early ‘90s fads, Strazewski and Parobeck take things a bit further by pitting the JSA against a thinly veiled parody of Marvel’s X-Force -- an x-tremist pro-mutant organization called the New Order. Their leader, Cain, is a Parobeckized rendition of the Liefeld-era Cable (the only real difference is an eye-patch, which he apparently doesn’t need), and he’s surrounded by a stable of throwaways that could’ve easily stood in the background of any Mutant Liberation Front group shot. Some of the villains are straight out of the Official Handbook to the Marvel Universe, like an unnamed Feral parody (apparently he or she’s a dog, so that makes it totally different). His or her teammate Scud is an amalgam of Scalphunter and Harpoon of the Marauders, and one member named Ammo has a gun-arm reminiscent of the Daredevil/Punisher villain Bushwacker. Bushwacker was originally introduced as an ally of the Marauders, plus Ammo just so happens to be the name of another villain created by Ann Nocenti and John Romita, Jr. while on Daredevil. I have a hard time believing that any of these were coincidences. Knowing now that the early ‘90s style has largely been dismissed as a joke, while Mike Parobeck’s art has retroactively been declared the high-water mark for superhero cartooning makes this issue an odd artifact. Not that the creators knew that they were eventually going to win some imaginary credibility award, but they are clearly aware that they’re swimming against the mainstream tide and perhaps vainly attempting to keep a classical hero style alive. Having Mike Parobeck do a Rob Liefeld parody undoubtedly adds some novelty to the issue, but it’s a testament to his artistic skills that the New Order characters still look as if they belong in this world. Everything Parobeck draws in the issue is clean, attractive, and instantly comprehensible. Parobeck originally entered comics as something of a John Byrne clone, so it’s fitting to see him joined by one of Byrne’s best inkers, Mike Machlan, for the series. I don’t know how I would’ve responded to this comic at age 12, but since I wasn’t totally brainwashed by the fads of the era, I’d like to think I would’ve recognized the obvious talent that’s on display here. I was fully onboard with the debut of Batman: The Animated Series a few months after the release of the book (and I think it’s important to remember that Parobeck hit on this style of cartooning independent of Bruce Timm’s work on the cartoon), so I know I wasn’t a complete moron back then. 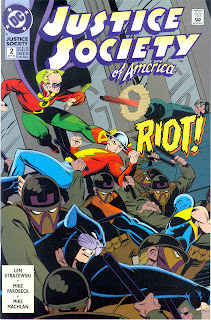 Outside of a few trades of the most recent series, I’m only vaguely familiar with the JSA as a concept. I know the basics -- the original team of superheroes retrofitted into the current DC continuity, whatever it happens to be this week -- but I’m utterly ignorant of most of the specifics. I don’t think it’s absolutely necessary that I’m aware of information like this: In the final issues of the four-issue Armageddon: Inferno limited series, the JSA returned to the modern-day DC Universe when Waverider transported the "daemen" of the interdimensional Abraxis to Asgard as a substitute for the JSA in the Ragnarok cycle, allowing the team to return to Earth. Hopefully, I can just enjoy the series on its own merits. So, join in me a few days to hear such incisive comments as “Most comics didn’t look like this in 1992.” and “Mike Parobeck sure could draw.” You can’t get this stuff anywhere else, people. 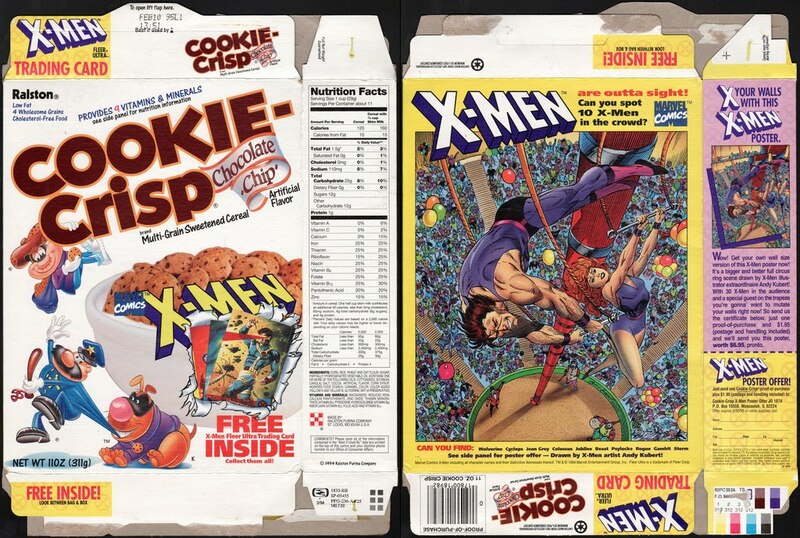 Remember When Cookie Crisp Gave Away Actual Comics? 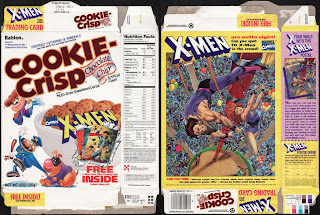 I discovered this when going through Jason Liebig’s Flickr page -- an X-Men promotional poster penciled by Andy Kubert for Cookie Crisp cereal in 1994. 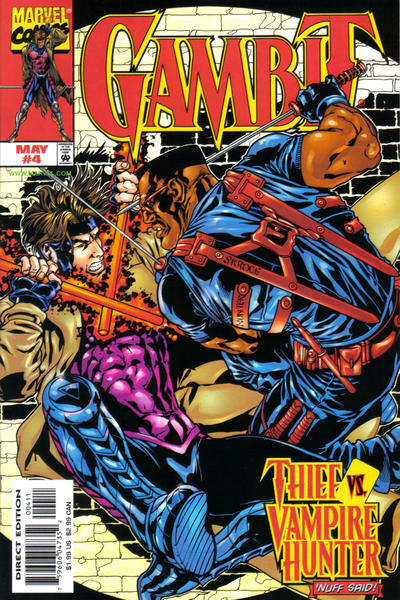 Apparently, Gambit was pasted over Nightcrawler in the final version, which is understandable given that Gambit was a more prominent character at the time. Now, why exactly is this set at the circus…? Summary: The X-Cutioner kidnaps Rogue and uses her as bait for Gambit. 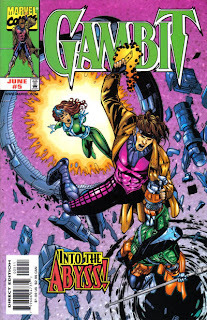 Following X-Cutioner’s orders, Gambit walks through a stargate and is teleported to his orbital base. 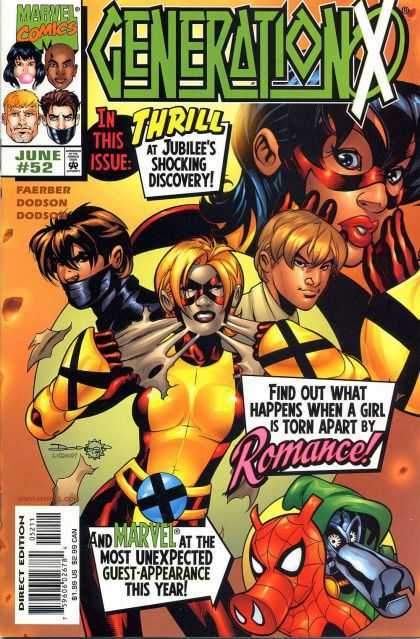 Gambit defeats X-Cutioner’s agents, Cosmo Stephanopoulos, Mariah Ellenthorpe, and Jack Farley, and soon finds Rogue. The X-Cutioner attacks, harming Rogue in the battle. Gambit turns the X-Cutioner’s staff against him, temporarily blinding him. In his confusion, X-Cutioner accidentally kills his men. Traumatized, he unlocks a buried secret about his father. 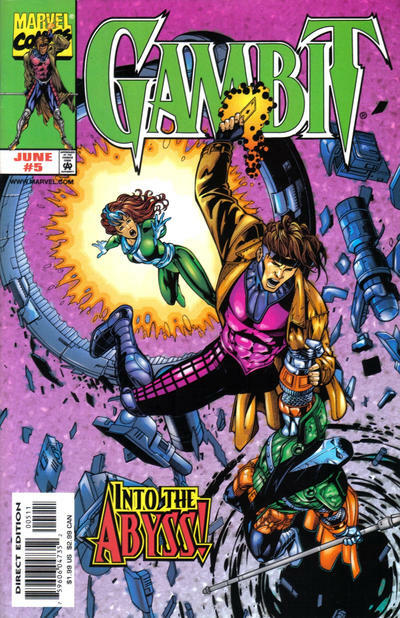 As Gambit and Rogue teleport to safety, X-Cutioner accepts his fate and stays to die onboard the collapsing satellite. Continuity Notes: Fontanelle examines the dreamscape of her employer, New Son. The only recognizable image she sees is that of the Dark Beast. New Son “promptly kicks her out of his mind!” when he realizes what she’s doing. Approved By The Comics Code Authority: Cosmo Stephanopoulos remarks that his teammate Mariah is “taking out a can of whupass” on Gambit. Sorry if this comes a little late, but I'm basically a newstand buyer any more. 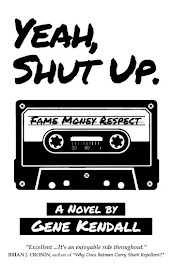 moment longer -- I LOVED THIS BOOK! excellent! If you haven't read this issue, do yourself a favor and go get it. out of the Tomb Of Ideas in a while! Either way, Fabe, for what it's worth, I loved this issue! Much of Gambit’s early positive feedback came from this issue, which really is the best installment so far, and perhaps the best issue of the entire series. While Nicieza is skimping over X-Cutioner’s established gimmick of only targeting mutant killers, and his previous encounter with Rogue in X-Man, he really has hit on a solid idea -- the X-Cutioner is a great foil for Gambit. X-Cutioner is a no-nonsense authority figure who secretly breaks the law to chase his obsessions, while Gambit is a light-hearted thief whose blithe façade hides intense shame and a deep concern for the people around him. Denti can’t help but to hate Gambit, and he’s grown increasingly fixated on him since their encounter in the first issue. The theme of masks shows up repeatedly during the story, as X-Cutioner ponders why he’s chosen this path for himself and why exactly he’s so afraid to face a buried memory about his father. He questions the mask Gambit’s cloaked himself in, eventually deciding that he’s hiding the fear that he “doesn’t deserve any better than what he heaps on himself.” While he’s confident that he’s figured his opponent out, X-Cutioner refuses to admit the fear that’s driven his adult life, until a friendly fire accident forces him to face the truth about his father. The execution of this scene is genuinely haunting; a true testament to what a talented creator can do with any character that’s been left by the wayside and never properly explored. It’s a little surprising that Nicieza gives X-Cutioner a fairly conclusive death scene after going through so much effort to establish him as Gambit’s perfect arch-nemesis, which might explain why Nicieza revived Carl Denti and the X-Cutioner persona in the second year of the series. This becomes a case of diminishing returns, to be honest, and I don’t recall if the mystery surrounding the revival is even resolved. 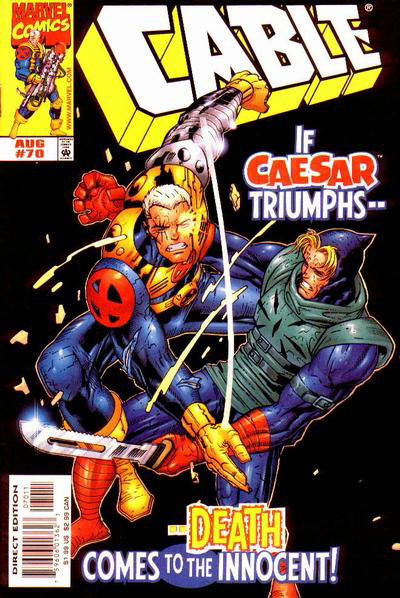 Still, this remains a great standalone issue, worth seeking out by anyone willing to take a Gambit vs. X-Cutioner story seriously. Summary: Gen X’s classmate Tristan Brawn threatens to expose their secret after he catches them training in the woods. His condition for keeping quiet is for Husk to go on a date with him. To everyone’s surprise, she agrees. Meanwhile, Emma gives Artie and Leech image inducers, which they soon misuse as toys. Later, Tom Corsi is introduced as a new teacher at the school, Banshee receives word of Siryn’s injury, and Jubilee discovers a disoriented Paladin outside of the school grounds. · Synch tries to show Chamber how to fly by using his powers. Chamber is unable to grasp the ability, and is annoyed that Synch can use his powers better than he can. · Colossus makes a cameo as a guest art instructor. · Spider-Ham and Ducktor Doom (I’m guessing that was his name) are not in this comic. That would be Artie and Leech playing with their image inducers. I Love the '90s: Jubilee comments that they don’t know Tristan Brawn from the Backstreet Boys. Artie and Leech’s hidden room is filled with Furbie dolls, and an original Playstation. Review: Jay Faerber never hid the fact that he was more interested in character drama than superhero fights, so it’s not a surprise that this issue only hints at possible violence in the future. This is largely a collection of subplots, and while none of them are particularly bad, none of them are really stand outs, either. 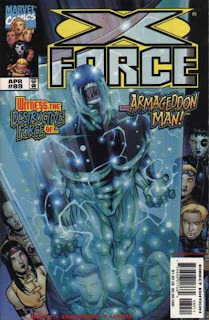 A human student is blackmailing the team, which is a decent idea but similar to one Larry Hama explored early in his run; some old continuity is dredged up, as Chamber’s non-existent ability to fly is finally addressed in an actual story, and Tom Corsi returns from the Realm of the Almost-Dead; cross-title continuity is acknowledged for the first time in a while, as Banshee is notified of Siryn’s injuries in X-Force; and a few character subplots continue as Jubilee prepares to make her claim on Synch while Husk tries to make Chamber jealous. Faerber’s still getting some mileage out of the integrated school concept, with an amusing scene that has M quickly ruining Chamber’s reputation as sexiest male on campus, and it’s hard to complain about a Spider-Ham cameo, even if the cover is slightly deceptive. So, nothing too exciting, but Faerber writes the characters well and the Dodsons are doing a great job even in the “quiet” issues. 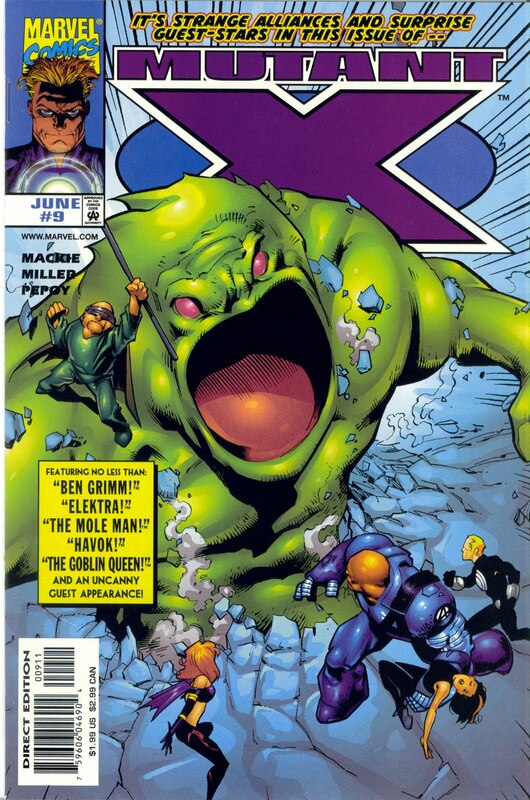 Summary: Havok is rescued from the Goblin Queen’s Sentinels by Ben Grimm, Mole Man, and Callisto. He’s taken to the underground, but demands to be freed so that he can check on his son. Callisto arranges for his release, only to reveal that she’s cut a deal with the Goblin Queen to give up Havok in exchange for the underground’s safety. When Havok refuses to surrender, Goblin Queen burns Callisto’s face. 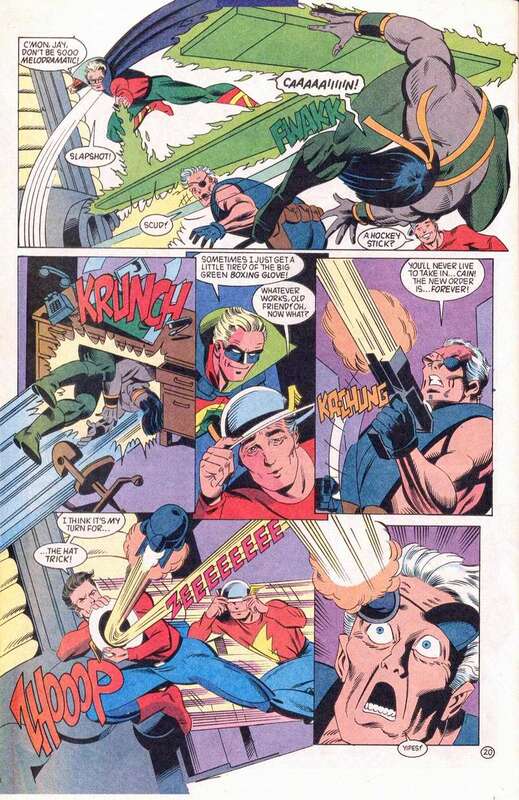 Havok fights his former teammates, as Magneto suddenly appears. “That’s Crazy Because They’re Different”: Callisto’s face isn’t scarred (until of course Madelyne burns it off), and she’s in a relationship with Mole Man. Better Than X-Factor? 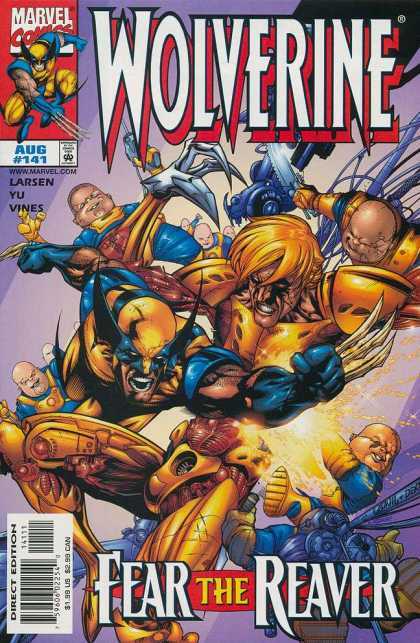 : This is probably on the same level as Mackie’s average X-Factor issue. That’s a polite way of saying that it’s a clumsy collection of mashed together, half-formed ideas. It’s hard to be charitable towards a series that has the protagonist falling to his death out of a skyscraper at the end of one issue, then opens the next issue with the same character talking on a pay phone with no explanation whatsoever. I have to confess that I found the non-hideous Callisto and Mole Man pairing amusing at first, but unfortunately Mackie has to do the most predictable thing you can do to Callisto (outside of having her lose a fight to Storm) and ruin her face just a few pages after she’s introduced. The idea that her relationship with Mole Man is based, as far as we can tell, solely on their desire to live underground also seems like a stretch if you think about it. It’s not as if the mainstream Callisto was pairing up with random Morlocks simply because they were conveniently located. Unfortunately, Mackie seems to be falling into the trap of sheer gimmickry every issue of this series and is already squandering some of the decent ideas he established in the opening issues. Summary: Bedlam dons a psionic-amplifier to control the disoriented Armageddon Man. Siryn leads an attack against him, but is severely cut in the throat by Feral. Jesse betrays his brother and disrupts the psionic-amplifier, inadvertently freeing Armageddon Man. Bedlam escapes with most of the New Hellions, content with the catastrophe Armageddon Man will create. Tarot and Magma stay behind to aid X-Force, who manage to contain Armageddon Man once more. He’s handed over to the Senator, with the threat that X-Force is closely watching his next move. Later, at the hospital, the team discovers Siryn’s vocal chords have been severed. 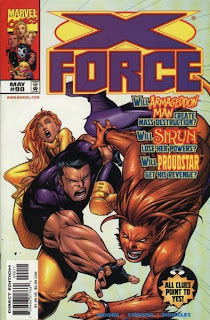 · Feral reveals that she was diagnosed with the Legacy Virus while in the Vault. She uses this to justify becoming even more hostile and violent. · Magma only stays behind to prevent the nuclear plant from melting down. She’s still adamant about not being a hero. Paradigm, however, returns to the site of the battle and makes peace with the team, claiming that he “learned much” from Moonstar’s journey through his psyche. Review: Unfortunately, this turned out to be a poor use of four issues. The introduction of Bedlam does resolve one of the title’s mysteries, and some forgotten characters are added back into play, but there’s no escaping the fact that this is a story arc devoted to a vaguely defined villain using a ridiculously overpowered plot device for generic evil. Fine for one issue maybe, but devoting four months to this is beyond excessive. Plus, injuring Siryn in the final chapter feels like a tacked-on stab at making this arc more relevant than it truly was. Moore’s a good enough writer to actually generate decent material out of her injury, but we didn’t need issue after issue of Bedlam, the New Hellions, and the Armageddon Man to get to this point. Making this storyline even more frustrating is the casual characterization shift for Magma, which is never explained, and the fuzzy resurrection of Tarot, which also remains a mystery. The most promising aspect of the story is the revelation that Feral has the Legacy Virus. Marvel never knew what to do with the Virus storyline, but if you think about it, Feral is the perfect character to be infected. As a not-very-heroic hero who went over to the dark side, her reaction to the infection could go in any direction. A writer could use this as an opportunity to humanize the psychopath, or push her further over the edge. Plus, she’s expendable enough to be a realistic candidate for a death scene, without being obscure enough for her death to be lumped in with throwaway characters like Infectia. 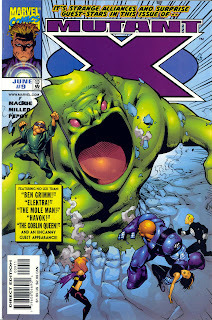 Yet, we’re only a year or so away from the Legacy Virus’ quickie resolution, so nothing’s done with the idea. Instead, Feral’s left in the background and only dragged out when it’s time to depower/mutilate/kill a recognizable character. 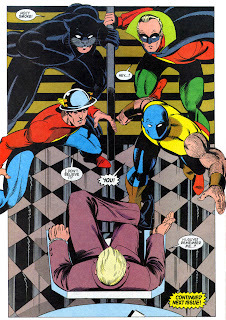 Speaking of which, have the Bedlam Brothers met similar fates in the modern Marvel Universe? Summary: At Xavier’s behest, Wolverine performs a computer test at Gen X’s school. Gateway materializes and abruptly teleports Wolverine and Jubilee to the Swiss Alps. They find sanctuary inside Cable’s chalet, unaware that it’s now occupied by Donald Pierce, who’s used Cable’s technology and database to build a suit of adamantium armor. Wolverine attacks, but their battle is interrupted by the mysterious Khyber. Khyber targets Pierce, destroying Cable’s chalet during their fight. He emerges with Pierce’s body and teleports away. Wolverine and Jubilee are left in the cold, waiting for Gateway to create another portal. · Pierce discovered Cable’s Swiss hideout after Sebastian Shaw left him for dead in Cable #53. He claims that he stumbled upon Cable’s abandoned sky cycle, which carried him to the chalet. · Synch leads Generation X (sans Jubilee) in an impromptu attack on Wolverine. Synch claims it was merely a training exercise, but Jubilee has a suspicion that something else was going on. I have no idea if this was ever resolved, but it’s quickly forgotten this issue. Review: Larsen’s entered a pattern of one-issue action stories that pair Wolverine with members of the various X-teams. This could work, but it runs the danger of quickly turning the book into a series of disposable Wolverine Team-Up stories, which is what this issue mostly feels like. 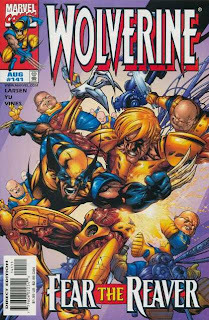 Of course there’s nothing wrong with pitting Wolverine and Jubilee against Donald Pierce, especially if another book has already gone though the effort of reviving him. As this issue points out, he’s the villain Wolverine and Jubilee fought against during their first meeting, so using him as the antagonist elicits emotions that, say, a Sauron fight probably wouldn’t produce. And, while I’m not sure who exactly is responsible for writing the first-person captions, I’ll give them credit for doing a nice job with Jubilee’s narration. 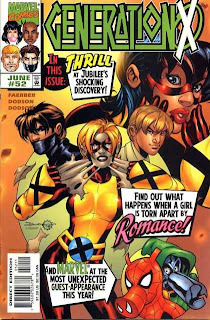 Her boredom with high school life and desire to return to the X-Men was dropped ages ago in Generation X¸ but I’m glad someone thought to revive it. The problem is that this is yet another issue that has Wolverine randomly running into trouble with another X-character, trouble that somehow involves a mysterious figure sneaking away with no explanation. Khyber is…apparently a cyborg that maybe looks like Wolverine…I guess? (Yu’s art isn’t very clear.) He’s also wearing a costume reminiscent of the one Wolverine will be wearing a few months from now when he’s brainwashing into becoming Death…so is that significant? Who knows. All we know is that he hates Donald Pierce, which conveniently leads to him finishing Wolverine’s fight and then teleporting away. Add this to the pointless Gen X fight in the issue’s opening, which the story goes out of its way to point out as odd, and you’re left with a comic that seems to be killing pages and lazily concluding stories with no explanation outside of “MYSTERY!” Although the dialogue is much less painful, this is far too reminiscent of the stunts Howard Mackie was pulling on X-Factor during that series’ nadir. Summary: An elderly man squatting in Stacey’s apartment building believes he’s created a time machine. Against her wishes, her little brother Kenny befriends him. While visiting her apartment, Cable breaks off his budding romance with Stacey. 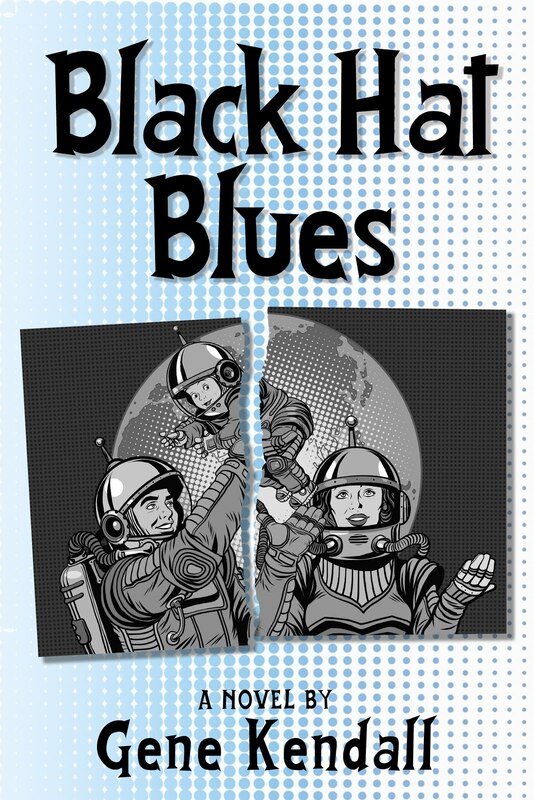 When he has second thoughts and turns back, he discovers Caesar has taken her hostage. 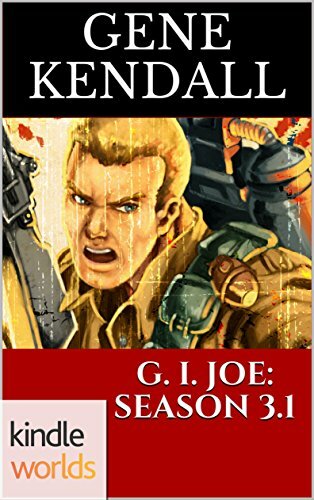 Cable’s fight with his estranged follower leads to the basement, where Kenny is visiting the old man. A battered Caesar tries to escape in the time machine, only to have it blow up in his face. Cable uses his telekinetic shield to protect Kenny and the old man. After the building is evacuated, he embraces Stacey and kisses her. Continuity Notes: Caesar is the jaded Askani member from Cable #58 who resents Cable for disbanding this century’s Askani order and suggesting they get real lives. He claims that he’s killed Cable’s “believers” (presumably the group of average citizens introduced by James Robinson who believe in Cable’s cause and occasionally offer help) all around the world and is now ready to finish the job. Review: It’s Joe Casey’s final issue, which means he’s got to resolve the dangling Caesar subplot, determine the status of Cable and Stacey’s relationship, and have Cable learn some kind of a lesson about hope, faith, and the future. He’s also decided to introduce a new character, a deranged man who’s convinced he’s a time traveler, and spend a few pages on his elaborate backstory. That’s a lot for twenty-two pages, but luckily Ladronn is great at drawing tiny panels and working a lot of information into each page. Despite some people’s claim that Casey’s work on Cable was a revelation, his approach to the character wasn’t radically different than Jeph Loeb’s(and Loeb’s run largely followed in the direction Fabian Nicieza had set for Cable during his later X-Force days.) We all know by now that Cable is more of a pacifist, he isn’t relying on guns, and he’s opening up to the people of this era, rather than using them as soldiers in his war to save the future. Casey’s major contribution was moving him physically away from the X-Men and giving him a few civilians to interact with (and let’s remember that the impetus for this direction came from James Robinson’s brief run). I agree with the decision to ground Cable, but I don’t see why it was viewed as such a groundbreaking move. I will give Casey credit for moving Cable away from the messianic role that was grafted on to him, since that always seemed like an awkward fit. I have a feeling that Robinson was going to go heavily in that direction, while Casey had Cable disband this era’s Askani order and tell them to move on rather early in his run. Killing Cable’s “believers” off-panel might be seen as a cheap move, but they were cheap creations in the first place. I still refuse to believe that the Cable of the Simonson-Liefeld-Nicieza era had a secret sect of powerful humans who believed in his alleged “cause” and was helping him out. That guy was bullying teenagers into joining up for a human-mutant war; it’s hard to believe that he was secretly a spiritual advisor to the rich and powerful in his spare time. Regardless, Casey returns to his core themes for a final time, drawing a parallel between Cable and the deranged homeless man who’s built an unstable “time machine” in the basement. When the old man realizes that his future is all gone, Cable naturally sees himself in the man and begins to ponder what he’s sacrificing. He’s learned now that the future will never be known, and that he has to stop using his war as an excuse for removing himself from the people he’s allegedly fighting for. He’s learned this lesson probably five or six times by now, but it’s executed quite well this time, making this an appropriate ending to the Casey/Ladronn era. NEXT ISSUE: Rob Liefeld returns, which doesn’t make anyone mad at all. Armageddon Now Part Three - Hellions Triumphant! Summary: Under Paradigm’s influence, X-Force retrieves the Armageddon Man and takes him to Bedlam’s base inside an abandoned nuclear plant. Feral and Switch kidnap Senator Owen Danville and take him to Bedlam, who orders Danville to contact the government and convey his demand of a billion dollars in exchange for keeping Armageddon Man inert. While they wait for the government’s response, Bedlam catches Jesse trying to escape, but convinces him to stay. Tarot, however, turns on Bedlam after foreseeing the destruction that Armageddon Man will create. 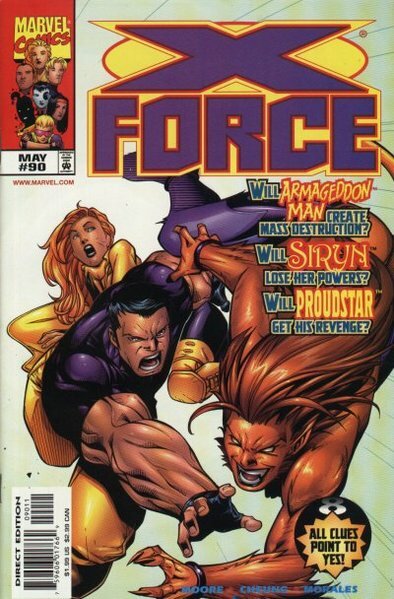 With her help, Moonstar frees X-Force of Paradigm’s influence. Jesse tries to protect Tarot from an enraged Bedlam, and is decked by his brother. Suddenly, the coolant tower collapses and Armageddon Man emerges. · Moonstar connects to Paradigm’s psyche while under his control and learns his origin. Paradigm was a young telekinetic in Hong Kong who was injected with a sample of “a techno-organic alien” by a mysterious group of scientists. · Tarot claims that her death at the hand of the Sentinels was “transient” and that she owes Bedlam for nursing her back to health. Review: Since most of this issue is dedicated to getting the plot device of Armageddon Man in his proper place, it’s a bit of a drag on the storyline. The erratic characterization of Bedlam also hurts the story, as Moore has him shift from mutant extremist to greedy extortionist to left-wing activist all in the course of a few pages. As Bedlam points out, none of these stances necessarily contradicts one another, but rather than making the character appear complex, he comes across as an unfocused concept. Moore does take the time to give Paradigm an origin, and explore Jesse and Tarot’s motivations for joining Bedlam, but that’s really the extent of the character work. And even then, we’re left with the bizarre explanation that Tarot, who confirmed that she was truly dead last issue, was in a “transient” death that Bedlam somehow managed to prevent. It’s hard to tell if this is just another vague clue, or the real explanation for Tarot’s revival. John Francis Moore tends to steer away from this kind of gratuitous, half-formed mystery while writing X-Force, so I’m hoping that this isn’t the last word on her revival. Not that it would be any cheaper than revealing that Emma Frost was in a coma after her definitive death scene, mind you, but Moore tends to be better than this. Summary: Chicault, a member of the Assassins Guild and employee of the Antiquary’s museum, is bitten by a vampire and converted. He targets the Antiquary’s child-slaves and turns them into vampires. Blade rescues one of the children, as Gambit returns to New Orleans. Teaming up with Gambit’s father, the heroes stop Chicault from using the children to access Antiquary’s library and gain information on the “Old Kingdom.” In exchange for freeing the children, the Antiquary’s ministers Tome and Hoard are allowed to keep Chicault’s notebook, which contains years of his research. Meanwhile, Fontanelle invades the dreams of Hazard, X-Cutioner arms the fired employees of Elysian Enterprises, and the Pig orders the Mengo Brothers to kidnap a Japanese boy. · The Antiquary has been missing for years according to Gambit, yet Tome and Hoard have apparently kept his operation alive. 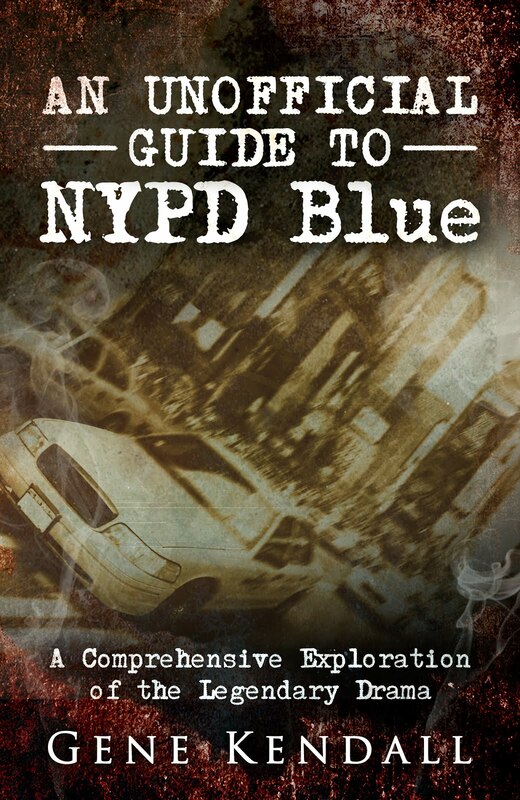 · The Old Kingdom is a mystery that will be dealt with in the book’s second year. · Chicault has information on “the so-called X-Ternal Elixirs” in his notes. This is presumably a reference to the X-Ternal Candra, who has a connection to the Thieves and Assassins Guilds. · Gambit is apparently on a first name basis with Anne Rice. Regardless, Blade makes a nice, unexpected guest star for the series, and Nicieza has worked up a plausible justification for his appearance. Unfortunately, doing a vampires in New Orleans story means we’re forced to endure more of the Thieves and Assassins Guild nonsense, but Nicieza is trying to downplay the sillier aspects of the concept and emphasize their connection to some of the creepier elements of New Orleans. Admirably, Nicieza tries to make the Guilds work throughout his run on the book, and this is one of his better attempts. This is a packed issue, and while I found it a little hard to follow on my first reading, it becomes clearer with a second attempt. I think the biggest stumbling block would be the casual introduction of the Antiquary, an off-panel character who we discover maintained a child slave operation, and somehow housed a museum that contains Guild secrets. He’s fleshed out more in subsequent issues, but Nicieza treats him as if he’s an established concept this issue, which makes the story a little more confusing than it needs to be.